Romantic French style curtain sheers. Simply filtering light or beautifully embroidered. Catch light through your space with this semi-sheer window panel, accented with diamond-patterned embroidered roping allover for a textural touch. Equipped with loops along top edge for easy hanging and fringed trim along bottom edge. Linen window curtain with floral embroidery. Give any room a stylish glow with soft lightweight sheer and shimmering diamond embroidery of the Irina window panel collection from Madison Park. Rod-pocket sheers of ivory silk organza; embroidered with golden butterflies. Semi-sheer striped curtains in casual linen/cotton fabrication. Styled with rod pockets and back tabs. Sheer curtain panel. Hidden tabs. Weighted on bottom. Flirty and feminine, this Petite Fleur window treatment collection exudes a classy appeal in any room with a sweet floral motif and sheer styling. Bring a breath of fresh air to your home's decor with the breezy floral lace and delicately ruffled edges of the No. 918 Alison Priscilla curtain set from Lichtenberg. Styled in delicate lace with a delightful floral jacquard, this No. 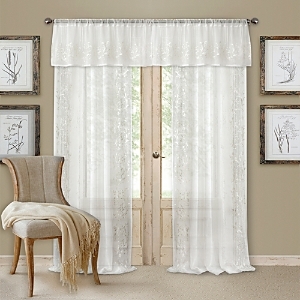 918 Alison window treatment collection from Lichtenberg adds a touch of timeless elegance to any setting. Bring any room to life with the ethereal semi-sheer design and beautiful watercolor blossoms of these Modern Bloom curtain panels from DKNY Make your home's decor sing with the swirling ogee pattern and breezy sheer of this Lyric window panel from Chf. Bring your windows to life with the fresh floral print and breezy textured sheer of these Landscape window panel pairs from DKNY. Silvery stars float atop sheer cotton voile for a UO-exclusive window panel that's out of this world! Long and topped with ties for hanging from any size curtain rod; sold separately. Comes with one panel. Makes a stunning entry way for parties, too. Sheer window panel that bathes your space in a luminous glow, accented with tonal striped piecing + eyelash fringe texture throughout. With looped tabs at top for easy hanging. Silvery stars float atop sheer cotton voile for a UO-exclusive window panel that's out of this world! Long and topped with ties for hanging from any size curtain rod; sold separately. Comes with one panel. Makes a stunning entry way for parties, too. A study in wildflowers, this sheer window panel features botanical illustrations by Holli Zollinger for Deny. Polyester panel with a rod pocket sleeve along top edge for easy hanging Feminine floral patterned window panel designed by Marta B. Camarasa for Deny in a sheer finish with a lush print allover. Polyester panel with a rod pocket sleeve along top edge for easy hanging. Sheer + floaty, this lush floral window panel features a colorful print designed by Burcu Korkmazyurek for Deny. Polyester panel with a rod pocket sleeve along top edge for easy hanging. Perfect on their own or layered for contemporary appeal, refresh any room's look and feel with the soft lightweight sheer and classic ogee jacquard of these stylish Adele window panels from Madison Park. Lush floral window panel makes your space feel like a garden full of yellow flowers with a colorful print designed by Nadja for Deny. Polyester panel with a sheer rod pocket sleeve along top edge for easy hanging. Silvery crescent moons float atop sheer cotton voile for a UO-exclusive window panel that's so cosmic! Topped with ties for hanging from any size curtain rod. Comes with one panel. Makes a stunningly celestial entryway for parties, too. Chevron patterned window panel available exclusively at UO with a sheer finish that lets the light in just so. With print at bottom edge and loop tabs along top edge for easy hanging. Blooming floral patterned window panel. Made from a soft cotton weave with a semi-sheer finish that sends a glowing light through your space. Featuring tabs along top edge for easy hanging Geo-patterned lace window panel that lets glowing rays into your space through the sheer weave. Equipped with a rod pocket at top edge for easy hanging. Vintage-inspired floral printed lace window panel, exclusively available at Urban Outfitters. Printed design distills light through your space with a luminous glow. Features a rod pocket sleeve along top edge for easy hanging. Add some whimsical style to your windows with the breezy light-diffusing sheer and cheerful burnout birds and branches featured on this Averil curtain panel from Madison Park. The grommet top makes hanging and styling a cinch. Folk-inspired floral patterned window panel made from a semi-sheer cotton weave with rod pocket sleeve along top edge for easy hanging. Attention-grabbing medallions and crisp stripes adorn the delicate, light-diffusing sheer of this Roosevelt curtain panel from J Queen New York, bringing a warm glow and sophisticated feel to any setting. Bring a fresh, natural feel into any room with these Winslow window panels from J Queen New York, featuring a charming floral print and a sheer design which allows subtly-filtered light to brighten your space. Transform any room into a beautiful beachfront villa with the breezy sheer and relaxing tropical print of the St. Croix window panel collection from J Queen New York. Ruffled gauze window curtain that instantly romanticizes any room! Ruffled gauze window curtain that instantly romanticizes any room! 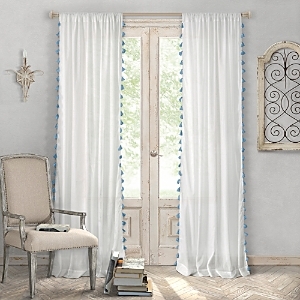 Gauzy textured window curtain striped with pompom trim for a subtle boho accent in any room. In mid-weight cotton that lets in just the right amount of light, sold as a single window panel. Give any room a glamorous glow with the gauzy burnout sheer and gorgeous floral pattern of these Halo window panel pairs from DKNY Bring chic style and a cheerful glow to any room's decor with the breezy light-diffusing sheer and soothing stripes of this Soho curtain panel from Dkny. Give any room a refreshing look and feel with the chic semi-sheer styling of these City Sky window panel pairs from DKNY. Bring a light, breezy feel to your space with the Angelica Volie Collection from Millar Curtains, featuring classic sheer style in your choice of six beautiful colors to match any decor. Gauzy textured window curtain striped with pompom trim for a subtle boho accent in any room. In mid-weight cotton that lets in just the right amount of light Light + airy, the Chloe Gauze Curtain adds some colorful interest to the room while allowing natural light in. In a soft cotton weave finished with a tunneled top and matching tie. Light + airy, this patchworked gauze curtain adds a breezy-boho look to the room while allowing natural light in. In a soft cotton weave finished with tabs along top edge and matching tie. Sold as a single panel. Cotton voile window curtain in all our favorite solid hues. In a semi-sheer construction that lets just the right amount of light in, topped with tabs for hanging Curtain panel with knotted loops at the top for adding drapey floor-length drama to any space. 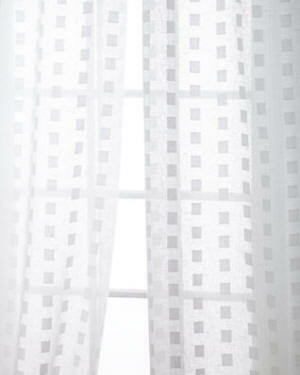 In soft cotton that's just a little sheer, hang from any size curtain rod (sold separately). Comes with one curtain panel.